What a great event the was again this year! Even though the weather was a little too cold for my liking, there was still a great turn out and I had a blast. I mean it’s a festival celebrating a delicious warm meal, in the middle of winter, when we’re all chilled to the bone. 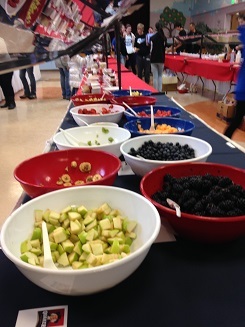 Plus, who could resist the world’s largest oatmeal toppings bar? If you’re not familiar with this particular brand of fest in Lafayette, it’s a great blend of education and entertainment for families of all ages! I think what I love most about the Quaker Oatmeal Festival, is that it makes healthy living – be it exercising, eating well and, of course, dental health – fun, accessible, and easy to do! Not to mention, the Quaker Oatmeal Festival has been around for a whopping 19 years and just keeps getting better! Despite the layer of frost gracing our streets and sidewalks, adults and kids donned their numbered bibs and joined in on the Quicker Quaker 5k Walk/Run around town. The little kiddos were bundled up to their foreheads in scarves and mittens while the marathoners were out in shorts and sneaks. Brrr! I participated with a table at Health Fair portion of the event and discussed dental healthcare (and my favorite topic, TMJ), but it was really a blast just to mingle and hang out with the community. 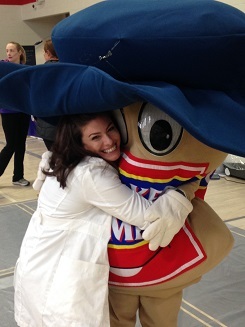 I even got a big hug from local festival celebrity, Oaty, the Quaker Oats mascot! I can’t wait for this fest to roll around again next year. Get it? Rolled oats!